From the 23rd – 24th of April the Eubronet meeting 2015 took place in Basle. It was a pleasure to welcome 22 participants representing 14 Eubronet partners. We had an interesting agenda for these 2 days. After the News from every country, we invited Zurich Insurance for a presentation of compliance in international programs. Beeing compliant, especially in international programs, is getting more and more important. The Zurich presentation was very interesting and gave us new information how to advise our international clients effectively. After this compact information we had dinner in a traditional restaurant in Basle. (www.schluessel-zunft.ch) It was great to see how good the atmosphere among the members is. Not only from the knowhow point of view, but also the personal contact is very unique in our small but effective network. On the second day we started with the presentation of our newest member of Eubronet. Roscoe Facwett from Bridge in UK (www.bridgeinsurance.co.uk) presented the company. We are sure to have a very strong and competent partner in UK again. We welcome Roscoe and the whole «Bridge-Team » to the Eubronet family. After the Bridge presentation Mrs. Alexandra Ganz presented a tool for collecting information about specific country requirements for international clients. This is an issue we need to follow up in the time to come. Special thank go to Mr. Remy Thiebaut. As president of Eubronet Remy was very involved with the development of our network during the last 5 years. At the meeting in Istanbul in 2014, the Eubronet partners expressed the wish that the next president of Eubronet be from Switzerland. It was a pleasure and privilege for me to accept this function. My goal is to develop our cross boarder relationships within the network. I shall do my very best to support our partners in all international business wherever I can. I am looking forward to work with all our partners in the next years. I would like to thank everybody for their commitment to Eubronet. Thanks to all of you who found the way to Basle and also to all Eubronet members who were unable to attend this meeting. 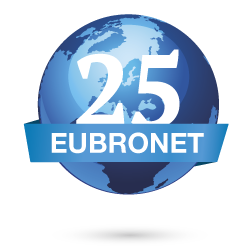 I look forward to see all our partners again at our next Eubronet meeting 2016 in Nice from the 21st to the 22nd of April 2016.